Creepy Graphic Bib Apron, Man Woman Teenager Steampunk Horror FX Cosplay Punk Fun-wear Kichen Apparel. 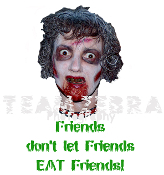 Funny ZOMBIE Photo Graphic ''FRIENDS DON'T LET FRIENDS EAT FRIENDS!'' Unisex Halloween Costume Apron. Costume accessory, great for gothic horror characters such as Butcher, Mad Doctor, Crazy Scientist, Wild Grill-Masters, and zombies both non-living and un-dead! ***Please Note: Image is NOT printed with Team Zebra Photography logo/watermark on finished product. Large white apron is made of a durable poly-cotton blend. Machine-washable, easy care, cotton polyester blend with sturdy heavy-duty stitching. Each barbecue butcher-style apron measures 33-inches from top edge to bottom edge. (*Approx 24-vertical-inches, as pictured on one example photo featuring a 6-foot, 4-inch man). Anyone, including Dad, will be grilling out in style. -Longer chef style apron features our custom designed 7.5-inch x 9.5-inch image on upper front. -Unique gift for barbecuer, gourmet, chef kitchen attire, Halloween host or hostess costume!